Peter-Hans Kolvenbach, S.J. at General Congregation 35. 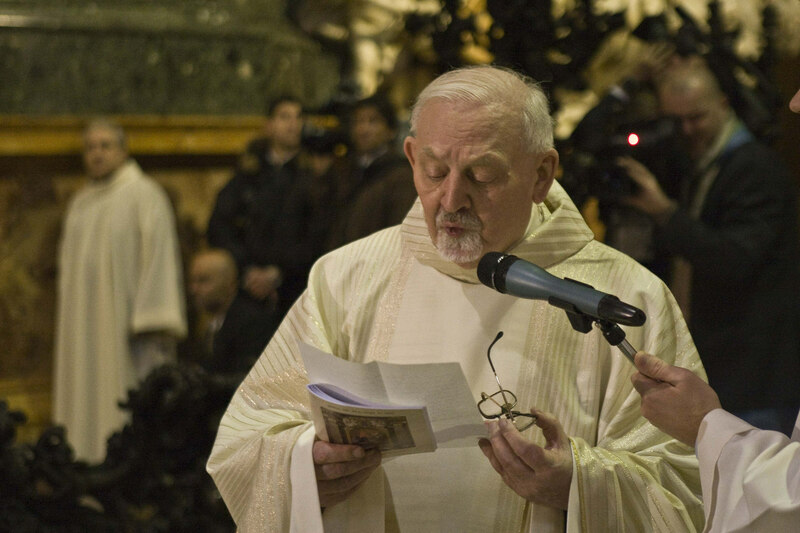 Editors' note: On Nov. 26 America learned about the death of Peter-Hans Kolvenbach, S.J., the former Superior General of the Society of Jesus. In 2007, Jim McDermott, S.J., interviewed him upon his retirement. On Sept. 13, 1983, Peter-Hans Kolvenbach was elected 29th superior general of the Society of Jesus on the first ballot. Originally from the Netherlands, he had spent most of his life teaching linguistics in Lebanon and overseeing the Near East Province of the Society of Jesus. As superior general, he would become well known for his diplomacy, discretion and wit, and for his encyclopedic knowledge of the people and apostolates of the Jesuits around the world. In January 2008, at their general congregation, Jesuits will elect a replacement as Father Kolvenbach retires after 25 years in office. He spoke with Jim McDermott, S.J., about his life, his time in office and his hopes for the church. What was it like growing up in the Netherlands during World War II? It seems that war experience belongs to the formation of a general. Before his conversion, Ignatius of Loyola defended heroically the fortress of Pamplona in Spain against the French army in 1521. Father Arrupe, my predecessor, had the cruel experience of the first atomic attack on Hiroshima in Japan. To my formation belonged not only World War II, especially the violent defense of the nearby German border from September 1944 until April 1945, but also the long years in war-torn Beirut when Lebanon’s independence was at stake. War teaches you to live in complete insecurity and precariousness, aware that coping with conflicts and tensions is more common than is a nice, peaceful existence. And after a night of deadly violence, the birds sing again, announcing that in spite of destructive human hate, death will never have the last word in the Creator’s will. To experience this paschal creed is good preparation for becoming a general. What led you to enter the Society of Jesus? As secondary school students after the war, we gathered books to make the lives of the many political prisoners more humane. In the midst of all the junk generously offered to us, I discovered a small booklet, which caught my attention because it contained not only words but sets of horizontal lines. I opened it and read Ignatius’ foundational principle. In all the turmoil and disappointment the war had produced, the vision of Ignatius came like a light. When I told my novice master how I had read this short text, he informed me that I had not understood it. Still, it brought me to enter the Society. How did you come to work in Lebanon? I was just sent. As a novice I had expressed the desire to go to Russia (no answer from Rome), then to Communist East Germany after a car accident in which that province lost all its novices (positive answer from Rome). But at the last moment I was sent to the Near East, where the ongoing war in Algeria could easily have led to the expulsion of all the French Jesuits. When in October 1958 we arrived by boat in the harbor of Beirut, Lebanon, fighting was going on. The 18 different religious groups were trying to dominate one another, making political and military alliances with the help of neighbouring countries. Still, Lebanon wanted to maintain a message that diverse people can live, work and practice their beliefs with one another. The welcome of the Lebanese was unforgettable. Even as the division in the country grew worse, never was the hope abandoned that Lebanon might become a sign of communal harmony for the whole Near East. When you became a Jesuit, did you have any sense that you might be elected general? In 1981, after Pedro Arrupe, the general at the time, suffered a stroke, the pope intervened in the governance of the Society and installed a delegate to run the Society. What was the situation when you were elected two years later? Thanks to the efforts of the delegate of John Paul II, Father Paolo Dezza, and his assistant, Father Joseph Pittau, communication between the Holy See and the Jesuits already was restored. The Holy Father himself was impressed by the obedient way the Society had accepted the quite severe intervention in its government. For a long time he had been reluctant to allow a general congregation to come together, especially to elect a successor to Father Arrupe, being afraid that given the sharp division among the Jesuits, a general congregation would be explosive and conflictive. Recognizing the union of our hearts and minds in obedient fidelity to the directives of the vicar of Christ on earth, the pope allowed the general congregation to go ahead. As a sign of its union it elected the successor to Father Arrupe on the first ballot. As general, what changes have you seen in the Society? Quoting the Holy Father, I would say that the Society of Jesus has become more spiritual, more ecclesial and more apostolic. It is more spiritual through the awareness that the mystical experience of St. Ignatius laid down in the Spiritual Exercises has to be lived out. In that living out we can help people today to encounter the One who stands at the beginning and at the end of every human life, giving us our personal vocation and mission. It is more ecclesial in that a “cordial indifference” with regard to the pastor of the church has been transformed into an apostolic harmony under and with Peter. It is more apostolic in that, according to Paul VI and repeated by John Paul II, wherever in the church there has been confrontation between the deepest desires of the human person and the perennial message of the Gospel, be it at the crossroads of ideologies, in the frontline of social conflict or in the most difficult and extreme fields, there have been and there are Jesuits. Six years after you were elected general, six Jesuits, their housekeeper and her daughter were killed in El Salvador; what recollections do you have of them? I had an opportunity to meet the Jesuits of El Salvador when huge disparities between the lives of rich and poor had provoked a war between the army and liberation fighters. The Jesuit university stood with the poor and with the murdered Archbishop Romero, working for the justice of the kingdom. When I visited El Salvador again after the killing of the Jesuit professors, it was clear that the assassinated Jesuits, like so many Christians before and after them, in spite of political and ideological implications had brought the countercultural gift of Christ to a world bewildered by injustice and violence, hatred and persecution. To preach Christ poor and humble with fidelity and courage, not only in the churches but in the universities, is to expect fierce resistance, even death. One of the Jesuits I met before he was murdered smiled when I told him he was considered a follower of Karl Marx. He quoted the Jesuit Constitutions, expressing his desire to resemble and imitate the Lord in some manner, who is the only way that leads to life. A number of Jesuit theologians have had struggles with bishops and the Congregation for the Doctrine of the Faith over the last 25 years. How would you characterize such conflicts? What is the role of a Jesuit theologian? The indispensable work of theologians has always advanced at the service of the church through misunderstandings and suspicions, tensions and conflicts. As the holy and learned Thomas Aquinas used to lament, with our very best human expressions and insights we succeed in saying what the divine mystery is not, but we will never be able to say fully what it is in all its profundity. Before Thomas the church fathers had spoken about the church as the mystery of the moon: it enlightens our night, but all its light comes from elsewhere (the moon being itself, as Professor Joseph Ratzinger observed later, just rocks and sand). With so many challenges coming up, we should thank the theologians for illuminating the road Christ’s church has to walk. Also, because they don’t possess the light themselves, they should with us and for us listen to the universal pastor, who is called to accomplish the great service of telling us in our search for Christ’s light, “He is here, he is not there” (as John Paul I said in his installation homily). A theologian cannot neglect this pastoral responsibility in carrying out his scientific task. How can the Ignatian charism positively influence the struggle with religious and social polarization? As long as we remain in the polarization of conservatives and progressives, of left and right, we will paralyze or block apostolic freedom and response. The Spirit is pushing us forward on the way to him who makes all things new, who will build up with us a new earth and a new heaven, the city of God. This newness of the Lord is not found in the hermeneutics of discontinuity, a breaking with the past, but, as Pope Benedict XVI pointed out, in the hermeneutics of continuity; newness is born out of him who is coming to renew the world by the fullness of his truth and by the accomplishment of the always new commandment of love. Instead of looking suspiciously at one another, let us look together to Christ. Could you speak about the current missions of the Society? Because the Jesuits are present worldwide, we have a “natural mission” to take care of people on the move: refugees, asylum seekers, undocumented people and migrants. This mission involves our presence in camps and in advocacy for more humane state regulations. The Jesuit Refugee Service has to operate often in a protean world, in which the people on the move are not only poor, but foreign and displaced. This service would not be possible without a large partnership with non-Jesuits, especially laypeople. It was the American experience that inspired us to develop this Jesuit-lay partnership. We are not serving the church well if we remain exclusively Jesuits “for others.” The Spirit speaking to us in the Vatican Council enabled us to rediscover the church as a communion within which we are called to be men “for others with others.” In all our works, educational as well as scientific, missionary and pastoral, social and in the mass media, we have learned to share our spiritual and apostolic inheritance: to listen and to learn from others. This feature of our Jesuit vocation has been strongly developed. I hope and pray that, inspired by the experience of St. Ignatius in the Spiritual Exercises, we can continue this mission, which leads Jesuits, other religious and laypeople to a personal encounter with the Lord, the origin of our vocation and of our mission in the world. How would you describe the situtation of the Society today? With Father Arrupe I would say that we as Jesuits are not as brilliant and excellent as people believe us to be, and we are not the liberals, protesters and free-thinkers some like to say we are. The Ignatian experience continues to push us in our way of life in the Lord and in all our activities to the magis—the ever greater glory of God, the ever fuller service of our neighbor. In the face of increasing apostolic responsibilities, in some parts of the world we are an aging society with less manpower, and in other parts a young society, numerous but still in training. It is a real struggle to assure the people of God of a service of apostolic quality and to face the many new challenges. There should be more “holy boldness” to go where the need is greater. As long as this desire for the glory of God is awake in us, as it is, we are in line with what the universal pastor expects from us. Are there particular Scriptures you rely on in your work? During my training in linguistics, a professor asked me to report on all the grammatical and syntactical irregularities in Greek of the last book of the Bible. I discovered in the Revelation of John not only linguistic errors, but many enlightening images of the One on the throne, of him who is standing at our door knocking, of the Spirit saying, “Come.” Even today its images point to the reality of churches—forgetting their first love, believing that they are alive when they are dead, listening to false prophets and still called by the Lord to wake up, to be cold or hot but not lukewarm. John’s message is not a doomsday story but a tale of two cities: the world of hate and destruction and the holy new Jerusalem coming down from God, where God lives among the people. What has being the general taught you about the Society, the church and God? It has taught me that the parable of the Lord in Mt 13:24 is more than ever the reality of the church and of the Society within it. In both the Lord has sowed good seed. The crop has matured; it is visible worldwide for all who want to see the hand of the Lord at work. If we open our eyes, we see in the church and in the Society so much growing. However, says the parable, throughout the wheat the enemy of human nature sowed weeds. And the wheat and weeds are so intermingled that the Lord of the harvest, in his concern not to kill the good coming up, lets them grow together. That evil sticks to the good things developing should be recognized, but it should not discourage us, because what he has started for us is good (Jn 1:1-3). And being always with us and for us, he will show the world, in a paschal way, that life is stronger than death, love is stronger than all possible evil. If everything goes well, I will join the rank-and-file Jesuits in the Near East, in the hope that I can be a help, not a burden in that war-torn region our Lord saw and loved. Do you have any advice for the next general? I am not free to give advice. St. Ignatius traced clearly the profile of the superior general, adding quality to quality: he should be one of those who are most outstanding in every virtue, and known as such for the longest time. Having said this, Ignatius probably realized that his profile was too idealistic, so he added that if the wanted qualities were absent, the candidate should at least not lack great probity and love for the Society. God’s help and favor will supply much, and the general can count on the good will and advice of his companions. My advice is to count on the Lord in prayerful discernment under and with Peter, sustained by the union of hearts and minds of all your friends in the Lord. This article also appeared in print, under the headline "Let Us Look Together to Christ," in the November 26, 2007 issue. Jim McDermott, S.J., is a former associate editor of America.